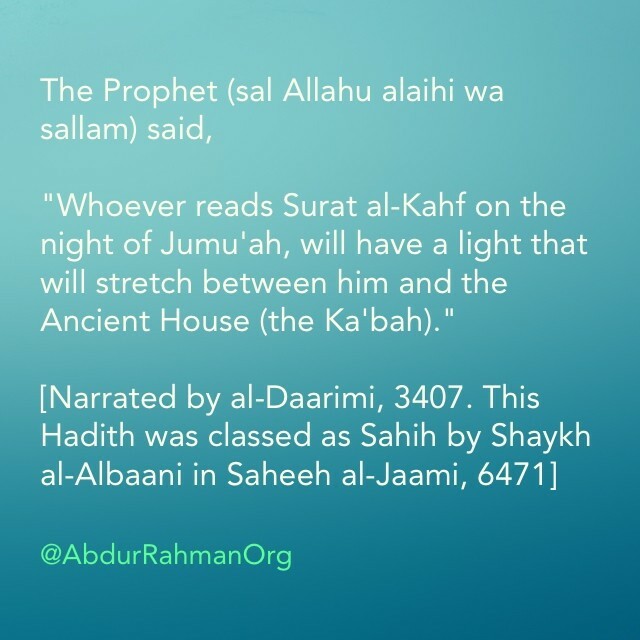 # Whoever reads Surah Al-Kahf on the day of Jumu’ah .. Note:-The surah may be read during the night or the day of Jumu’ah. The night of Jumu’ah starts from sunset on Thursday, and the day of Jumu’ah ends at sunset. Therefore the time for reading this surah extends from sunset on Thursday to sunset on Friday. Indeed, there is an hour (opportune time) on Friday and if a Muslim gets it while praying and asks something from Allah, then Allah will definitely meet his demand. And he (salallaahu ‘alayhi wa sallam) pointed out the shortness of that time with his hands.